Whoa, you're definitely constantly improving your shots! I simply love the contemporary feeling of melting snow in #1158/ 3 & 4 - that kind of images are seldom seen as they seem to be too trivial, but they are in fact a big part of the every day life we all are experiencing. Lot's of other good shots too, particularly of the hotel and Finnmarken. High ISO (>1600), big aperture (<3,5) and not too long times (<0,1 s). Never walked around in the streets with the tri-pod fully opened with camera mounted before. I stopped and took a picture wherever I felt like, be it in the middle of the street or what. It was real fun! (And in the darkness, some cardrivers thought I was a police with a laser speed measurer hahahaha). Wow Sterkoder. That was some of the most beautiful nightshots I have ever seen from your city. And it certanly was a nice afternoon inviting to take photos. I see I have a lot to learn about mightshooting. My favourite is #1159 / 3. Finnmarken transformed into a modern art-sculpture. Or a colotful water-fontaine ot something like that. Anf thanks for our THREE minutes at the pier. Two days on board looking forward to see you. And HUrtigruten offered us THREE long minutes. I wish I had at least one hour or two, to learn something about night-photographing of you. I travel without a tripod. So my photos is freehand-shooting. Or I use the rail on the ship. With a lot of vibrations and waves...... 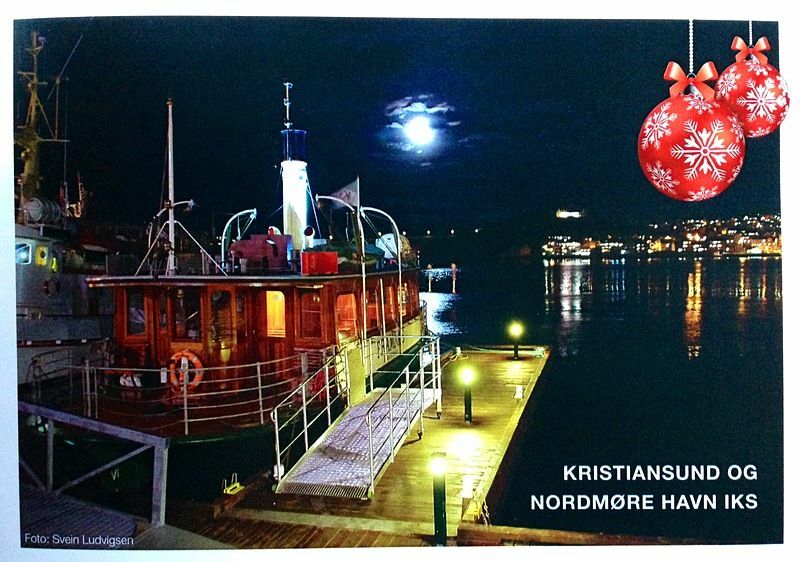 Thanks again for beautiful Kristiansunf-photos, and indeed great 3 minutes. Yes, and thanks again for those three minutes. Your church is so beautifully lit and stands out nicely from across the water, balanced in your photo with the sign up on the hill and the colour of its reflections. But I take special delight in those scenes of "my" island Innlandet ...my part of town because I stayed at the Thon Hotel of course. The lagoon looks so exotic and magical and Nordsund’s yellow stripe like a band of gold. And then the big dream-boat arrived! I so much agree with you Seagull. And Sterkoders words here made a little bit "proud" of giving him an excuse to Take this amazing nightshots. I didn`t really thought about that "One minute pr year" - statistic. But at least we got time to ONE. warm handshake, TWO big smiles and in all of a hurry switching camerasetting to AUTO for ONE flash-photo at the pier. Haha....., Prince of Darkness! (Yes, I know Ozzy use a F-word in there, but there can be children reading) :-) Smiles and handshakes...., there are too few. A bit more around, and the World would've been an even better place for all. I wish you more luck Northbound, when Jan-Martin returns to Bodoe. Have a good night drink at the coffee gang table and push up this shocking statistic to more friendly numbers! And it will be another opportunity for such breathtaking winter night shots! What a great job. You should ask Thon hotel, if they want to have some of your pictures for their brochures. When watching these nightshots I wonder why the Hurtigruten call is so short. The hurtigrute is just fresh out of a long halt in Trondheim, and if they are delayed out of there, they often use Kristiansund to get the timetable right again. We only have 30 minutes in the first place, reduced some time back from 45 minutes. This is too bad. Shorten the stop in Trondheim and Molde, and give back the time lost to Kristiansund. I have a friend (photographer) working for me towards Thon. Don't know if he get lucky, but if they buy, my images are worth a minimum of NOK 2.500,- apiece if used in a brochure. Great new photographs, and yes, you are getting better and better each time! The first image of the Thon hotel in the blue hour is perfect - very nicely exposed. Love the snow covered propeller on the previous page as well. It works. Great news, and a photo that really deserves to be exposed. You see, you're picking up quality really fast now! Great photo Svein - well done! Congratulations, Svein. That is something to be very proud of.